The loyal locals made their way once again to the Oregon/Nevada border “town” of McDermitt for the annual Fourth of July ranch rodeo this year. The one restaurant and all 35 motel rooms are located in Nevada, and every day all the contestants and spectators made the half-mile trip up Highway 95 to the rodeo arena just across the Oregon line. McDermitt is well-loved by the cowboy crowd because of its lack of “gladiator events.” Instead of trailer loading and/or doctoring, the events include team branding, ladies’ steer stopping, team roping, big loop cow roping, horse roping and bronc riding. The most manual labor any one team member has to do is flank a yearling in the branding contest – or, rather, a team roping steer, as yearlings are so darned valuable these days. McDermitt is well-known, but not necessarily well-loved, for being hot. “Hot” as in HOT, hott, h-o-t, any other way you put it, hot. There are no shade trees (hello, this is the desert!) and the wind usually likes to add to the fun by blowing super hard across the rodeo arena in the afternoon. So, my solution for the kids (and myself) the last couple years has been to bring a wading pool. Our inflatable wading pool has also served some time as a cat toy; hence its rather flattened appearance. But, the kids still enjoyed the heck out of it. Saturday was a sweltering thermometer-buster, as always. On Sunday, the unthinkable happened. 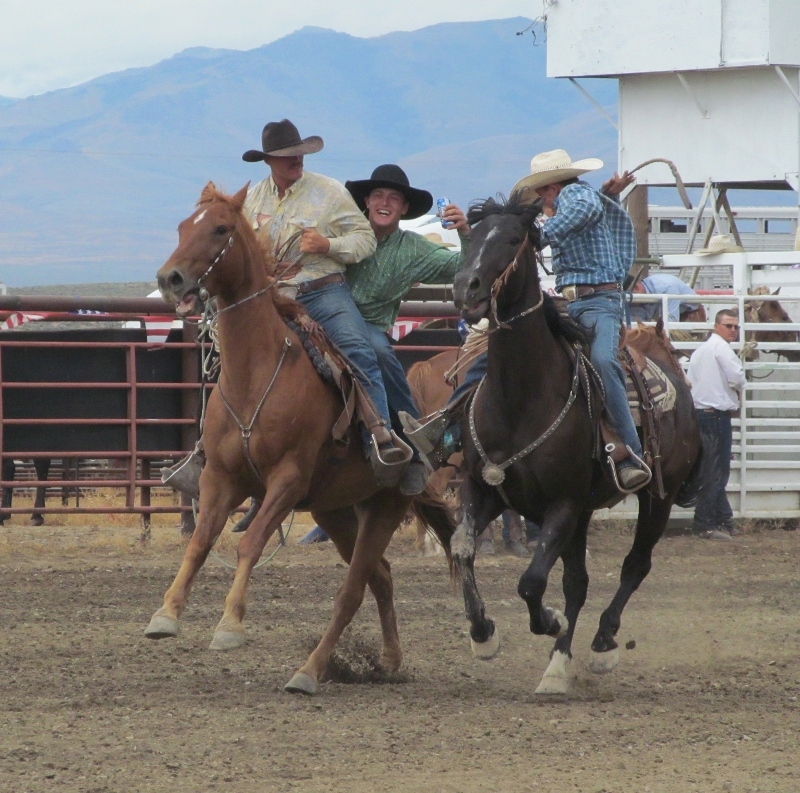 Steve Maher said he’s been coming to the McDermitt Fourth of July rodeo since the sixties and he has never seen this happen before. 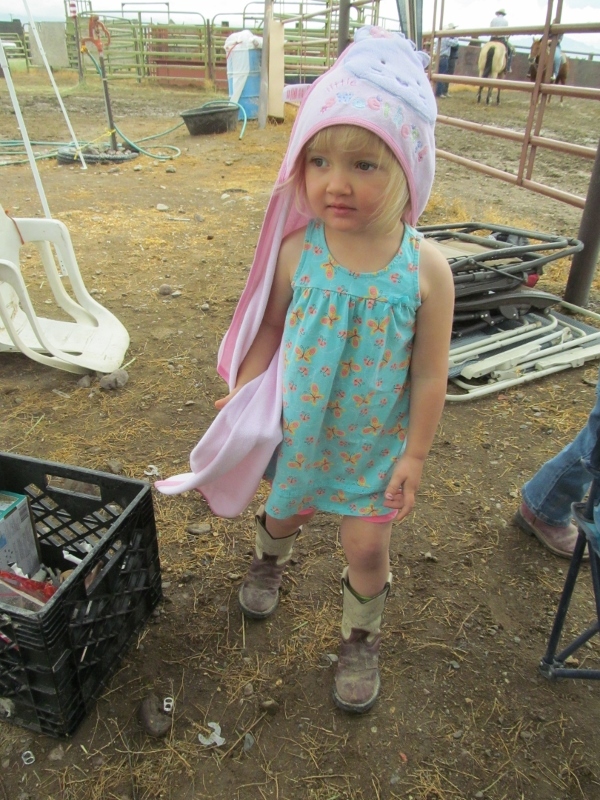 I felt about how the horses looked, because I never expected this could ever happen, so I didn’t pack a single pair of long pants, sweater or jacket for myself or my two-year-old daughter. So, Grace got to sport her hoodie towel for warmth. How many Mom points did I lose for this lack of preparedness? Probably a lot. Oh, well, at least we were able to bum a couple coats and a blanket from some better-prepared families later on, as the day grew colder. So weird. I’m still puzzled by this bizarre turn of weather. But, heat or rain, the rodeo will go on. 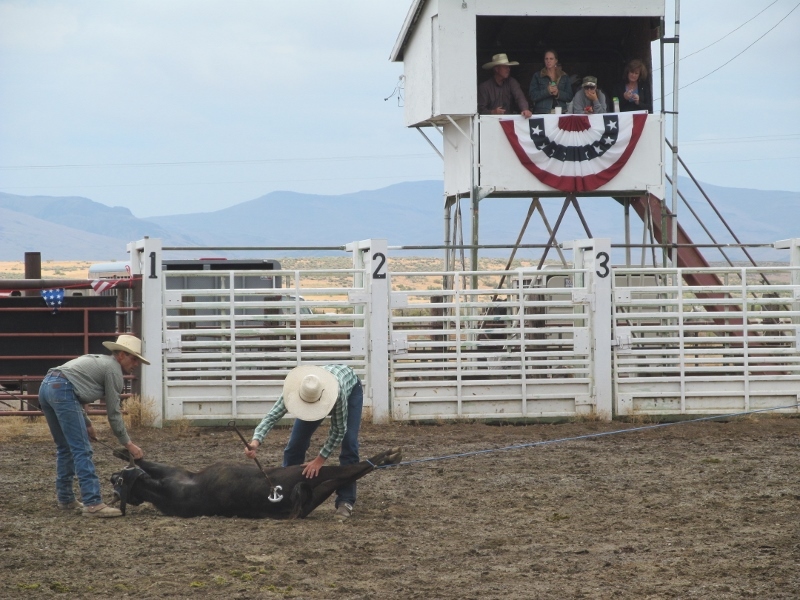 Here, half of the RO team slaps a paint brand on a roping steer during the team branding event. What is going on in this next picture? 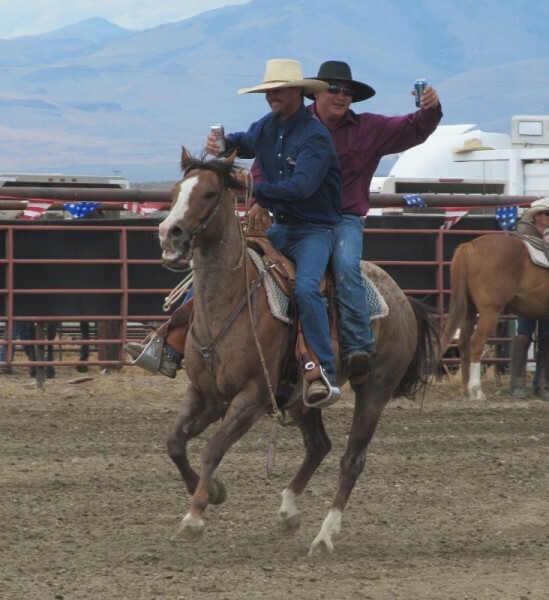 Is the pickup man romaling the runaway bronc packing…two riders? Nope, this isn’t a new event, this is just the grand entry. I’m guessing the Casey boys never did get around to saying “when” at the Say When Casino on Saturday night, resulting in this Sunday morning shennanigan. Of course, you can’t let your friends ride double alone. Is that even possible? Anyway, TJ and Junior had to get in some shennanigans of their own. 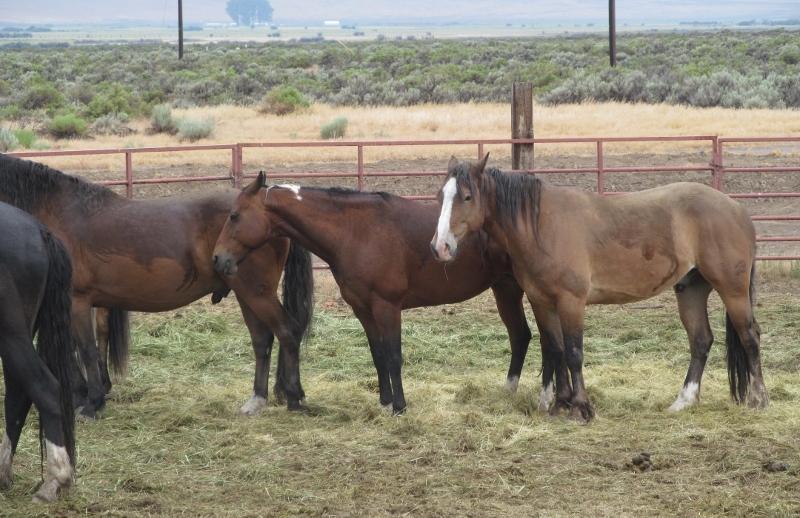 One thing about the Great Basin: the buckaroos might not be town broke, but their horses sure are. After the laughs of the grand entry, the ranch bronc riding sobered the crowd up. Two cowboys wound up taking ambulance rides, and one is still in Reno after suffering a broken jaw. His wife reports that he came out of surgery well, and now he is being monitored for signs of infection. Rodeo, like cowboying, is a dangerous way to spend the day. Prayers for Pook Hoots and his family are surely appreciated. 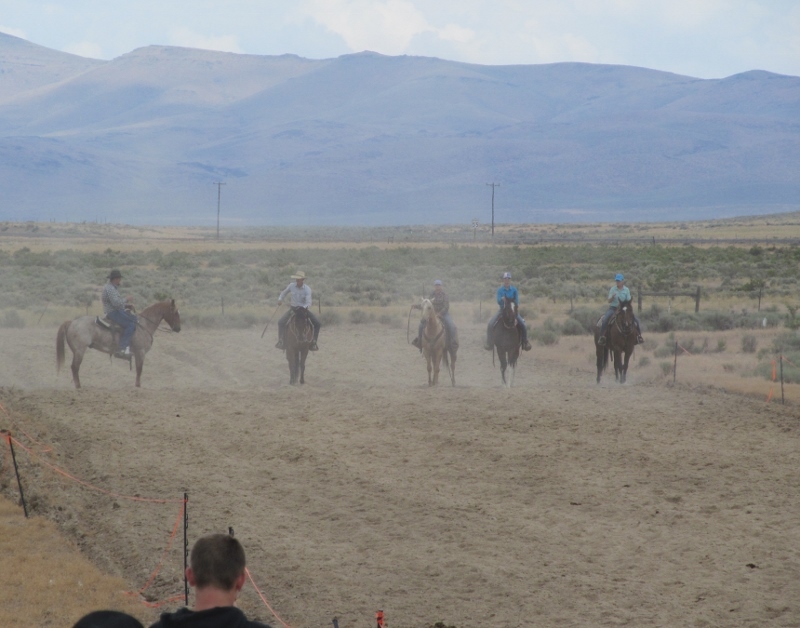 Not to leave you on a down note: here’s the line up for the ranch horse race, a crowd favorite each year. Bonnie Zimmerman of Winnemucca must have felt inspired by this spring’s Thoroughbred action, because she won the quarter-mile race for the third year running (get it….”running”). Anyway, she dang sure wasn’t slow loping when she crossed the finish line a couple lengths ahead of the nearest contender. I hope everyone had a great Glorious Fourth! 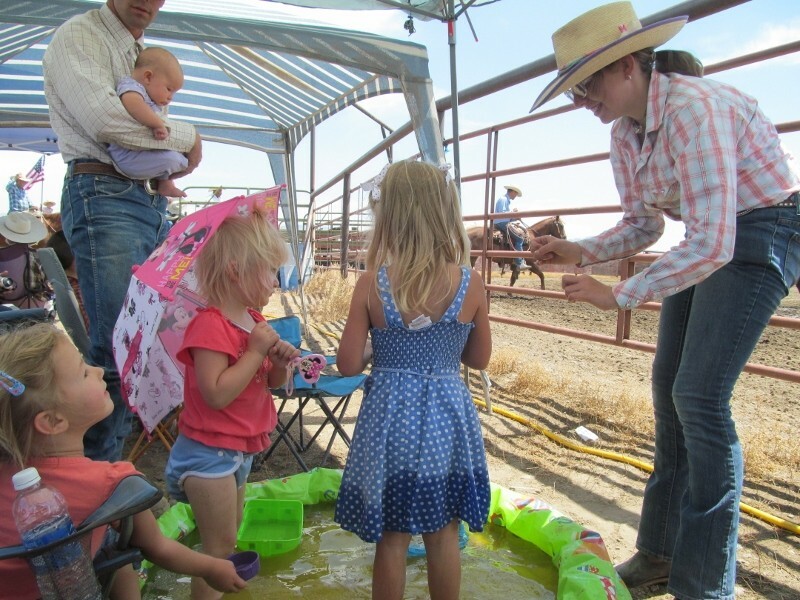 If you don’t have plans next year and aren’t abject to heat stroke, we’d love to see you in McDermitt. It’s BYOB, as always, and if you happen to have an inflatable wading pool that hasn’t served time as a cat toy, maybe you could throw that in the horse trailer, too.